Pakistan’s proud player Yasir Shah required only two wickets to become fastest man to reach 200 Test wickets. 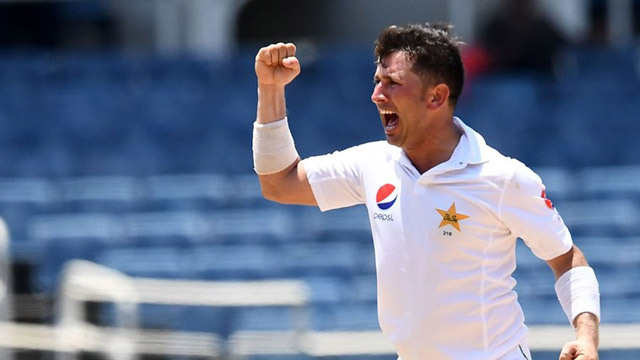 Yasir began his 33rd Test needing five wickets to become the fastest man to reach the milestone of 200 Test wickets. The record was set by 82 years ago by Australian leg spinner Clarrie Grimmett. New Zealand skipper Kane Williamson hit a fighting half century while BJ Watling batted with patience to delay leg-spinner Yasir Shah’s bid to become the fastest to 200 wickets on the first day of the third and final Test in Abu Dhabi on Monday. Williamson missed out on a 19th Test century but Watling was unbeaten on 42 as New Zealand closed on 229-7, a measured recovery after being reduced to 72-4 by a triple strike from Yasir in the first session. Information Minister Fawad Chaudhry on Tuesday took to twitter and wrote that nation is waiting for record breaking performance of Yasir shah.